THE WEEKEND BEGINS ON FRIDAY, SO WHY NOT START YOUR HAPPILY EVER AFTER THEN AS WELL?! FROM PERFECTING YOUR IDEAL WEDDING CELEBRATION TO FREEING UP THE REST OF THE WEEKEND, HERE’S WHY FRIDAY IS THE NEW SATURDAY. YOU WANT YOUR IDEAL VENDORS TO BE A PART OF YOUR SPECIAL DAY. YOU HAVE YOUR EYES SET ON THE PERFECT VENUE, PHOTOGRAPHER, DJ, ETC. AND THE FIRST QUESTION YOU ASK EACH ONE IS, WHAT’S YOUR SATURDAY AVAILABILITY? QUICKLY THEIR ANSWER IS "NONE, BUT WE HAVE SOME FRIDAYS OPEN". FRIDAY? WEDDING? YES, THAT’S A THING AND WE PROMISE, THEY’RE A BLAST! SO YOU BOOK YOUR FAVORITE VENDORS, YAY!, YOUR WEDDING IS ALREADY STARTING TO COME TOGETHER! THERE ARE SO MANY COST PERKS TO HAVING A FRIDAY WEDDING. I MEAN WHO DOESN’T LOVE SAVING SOME HARD EARNED MONEY? FROM THE VENUE TO YOUR VENDORS, MOST HAVE SPECIAL FRIDAY RATES THAT ALLOW YOU TO SAVE YOUR MONEY IN AREAS YOU NEVER WOULD HAVE GUESSED. SAVING MONEY ON ONE ASPECT OF YOUR WEDDING GIVES YOU THE OPPORTUNITY TO SPEND ON SOMETHING ELSE YOU REALLY WANT. YOU CAN AFFORD THE EXTRAS. MAYBE THAT’S IN YOUR IDEAL DÉCOR ITEMS OR YOUR BRIDESMAID’S / GROOMSMEN’S / PARENT’S GIFTS OR EVEN A SATURDAY BRUNCH WITH THE NEWLYWEDS. THE IDEAS ARE ENDLESS AND WE LOVE EVERY ONE OF THEM. AFTER A LONG WEEK OF WORK Everyone is ALWAYS ready to GET THEIR WEEKEND STARTED AND A Friday wedding allows your guests to unwind together as they celebrate you. If you have out of town guests, your immediate thought MAY BE they would probably have to take off work. BUT That’s not ALWAYS TRUE! some will happily take a half day or work remotely IF THEY'RE ABLE. Plus, (most) people enjoy adding a full third day to their weekend. Did WE mention recovery day on Saturday, which then gives people Sunday to be their day to prep for the upcoming week. Win, win for everyone! Wedding dayS CAN BE hectic for the bride and groom AND TRYING TO SEE ALL OF your guests in a short amount of time CAN BE difficult. That’s why planning a Saturday brunch OR AFTERNOON GET TOGETHER will give you an opportunity to talk and see your guests In a more intimate setting. and to make it even easier for you we've included some of our favorite Raleigh brunch spots below! 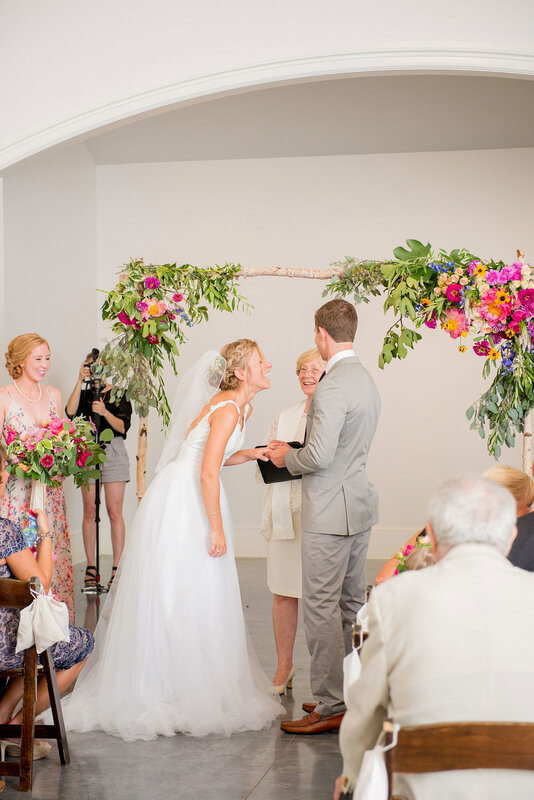 A timeline and favorite raleigh spots for guests. The cutest recovery kit for wedding guests! Don't Let Monday Stop You From Thinking About Sunday!